The Spine web player lets you easily embed your Spine animations on your website. Hide/show debug renderings of regions, meshes, bones, etc. Note: The Spine Web Player uses WebGL for rendering. While WebGL is supported by all recent versions of popular desktop and mobile browsers, there may be compatibility issues with old browsers. The Spine Web Player can display Spine skeletons exported from the Spine Editor in the JSON format. In addition to the exported .json file, the player also requires a texture atlas consisting of a .atlas file and one or more .png files. 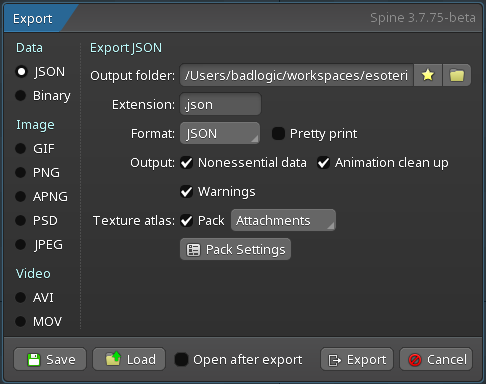 Please see the Spine User Guide on how to export skeletons to JSON and how to export a texture atlas for more details. These files must be uploaded to a web server and accessible via URLs. The .png files need to be accessible under the same path as the .altas file. For example, if the .atlas file is accessible via https://mysite.com/assets/spineboy.atlas, the .png file(s) must be accessible via https://mysite.com/assets/spineboy.png. Adding the player to your website consists of a few simple steps, detailed below. You can find the sources for the Spine Web Player in our GitHub repository if you'd like to build the player from source. This creates a new SpinePlayer in the player-container element. The player loads the Skeleton .json from the relative URL /files/spineboy/export/spineboy-pro.json and the .atlas file from /files/spineboy/export/spineboy.atlas. This particular texture atlas has one page named spineboy.png, so that image is loaded relative to the .atlas file, from /files/spineboy/export/spineboy.png. The code area in the below player is editable! Use it to experiment with the configuration options explained in the next section. With the above code, the player will choose default values for all its configurable properties: which animation to play, the background color, and many more. You can further customize the player's appearance and behavior through the configuration detailed below. The Spine Web Player offers a wide variety of configuration options to adapt it to your requirements. When using absolute URLs to another domain, it is possible that web browsers won't be able to load the assets. This is usually due to not having CORS enabled on the server that hosts the assets. The animation button will be hidden by the player if only one animation can be chosen, either because there is only one animation in the skeleton, or because the list of animations only contains one animation. The skin button will be hidden by the player if only one skin can be chosen, either because there is only one skin in the skeleton, or because the list of skins only contains one skin. We recommend using premultiplied alpha with all assets displayed by the Spine Web Player. It reduces artifacts and seams that may be visible when not using premultiplied alpha. Of course, you can omit any visualizations you do not want to enable by default, or set their respective property to false. The player background color can be set via the backgroundColor configuration property. The color must be specified as a hexadecimal RGBA color (#rrggbbaa). The player can be expanded to fullscreen by the user. A separate background color for fullscreen mode can be set via the fullscreenBackgroundColor configuration property. If not specified, the fullscreen background color will be the same as the backgroundColor. The url is a relative or absolute URL to the background image. The x and y properties specify the position of the bottom left corner of the image in the skeleton's world coordinate space. The width and height properties specify the dimensions of the image. By default, the player is opaque and will be drawn over any other HTML elements behind it. The alpha configuration property can be used in combination with the backgroundColor property to make the player translucent, allowing any HTML elements behind to be seen through the player. The player always tries to fill the container element it is embedded in. When an animation is chosen (or specified in the configuration), the player ensures the animation is fully visible inside the available player space. In the above image, the green rectangle represents the bounding box automatically calculated for Spineboy's run animation. It is padded by 10% on each side by default. The resulting viewport, indicated by the red rectangle, is then embedded in the available space of the player, retaining the viewport's aspect ratio. This automatic viewport mechanism can be customized via the player configuration. If no viewport configuration is given, the player defaults to the automatic behavior described above. The x and y properties specify the position of the bottom left corner of the viewport in the skeleton's world coordinate space. The width and height properties specify the dimensions of the viewport. If any of these properties is omitted, the player ignores all other properties and resorts to the automatic behavior described above. The padLeft, padRight, padTop, and padBottom properties specify the padding to be added to the respective sides of the viewport. In the example above, they are expressed as percentages. You can also specify absolute numbers in the skeleton's world coordinate space instead. If one of these properties is omitted, the player assumes a default value of 10%. 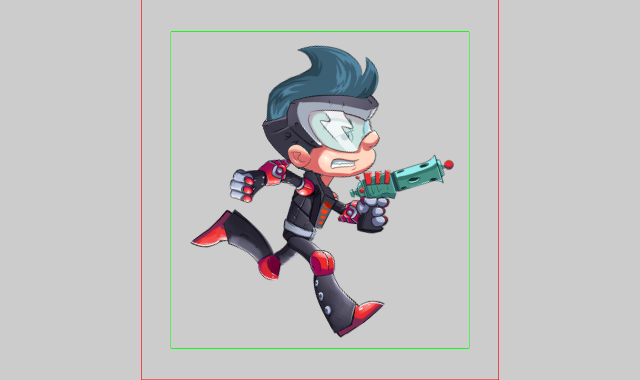 In the above example, we specify a viewport for the walk and run animations. For the walk animation, we define the complete viewport bounds including padding. The global viewport (or the automatic behavior if no global viewport is given) will be completely overwritten for this animation. For the run animation, we only specify the top padding. All other viewport values will be either derived from the global viewport, or from the automatic behavior.